Converting a 35mm or other photo slide allows it to be stored and managed on your computer, much like those from a digital camera. Another option is to have the photo slides converted to a disc-based format so they can be viewed as a slideshow on the computer or television. The image below shows an example of the low cost / standard quality process. Note the color tint and low level of detail visible in the dark color patterns. The image below shows an example of the high quality process at a resolution of 1800 dpi. 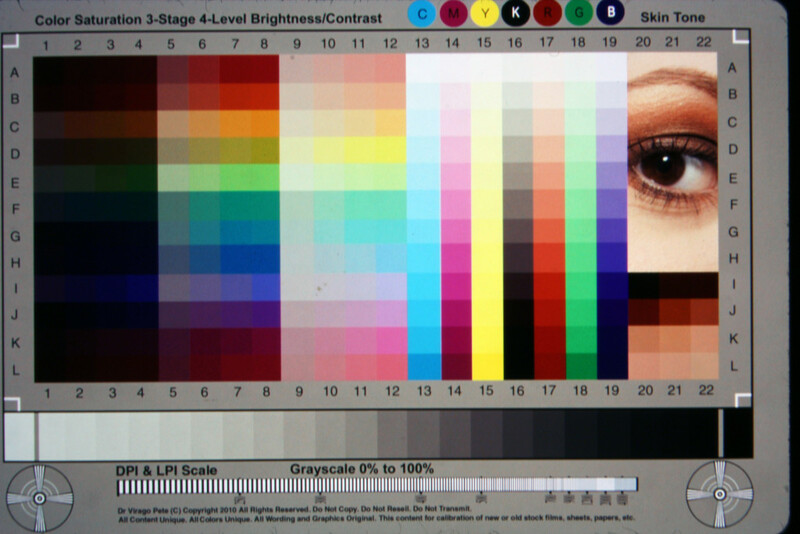 Note the correction in the colors, levels, contrast, and detail in the dark areas. The high speed scan process gives you the equivalent of an 8 Megapixel camera image of your slide which is about 2500 dpi. This process is very quick and can even be processed directly using your Kodak 80 or 140 slide carousels. Once the slides are digitized, we will post process your digital photos using professional grade software to correct the color, contrast and optimize the lighting levels. The quality of the low cost process is very good and many customers choose this option for archiving large collections of slides. Two Squares also offers a high quality scanning process if you desire the best quality possible. The high quality scanned photo slide comes in three options: 6400 dpi or 3600 dpi or 1800 dpi. The 6400 dpi scanned image would be equivalent to a digital camera image with a sensor of about 44-65 Megapixels. The 3600 dpi image would be roughly equivalent to a camera with a 14-18 Megapixel sensor and the 1800 dpi image would be about the same as an 4-6 Megapixel sensor. The high quality scans will also be post processed using professional grade software to correct the color, contrast and the lighting levels to further improve the quality. 1800 dpi is usually more than enough for most people unless you plan on creating large prints from your slides or you want the highest quality possible. An 1800 dpi scan of a 35mm slide (which is about 1.3” x 0.9”) will give you about 2340 x 1620 pixels. This is much higher resolution than a High Def TV at 1920 x 1080 pixels. Therefore, if you just want to watch a slide show of your pictures on TV or on your computer, 1800 dpi is more than enough. If you wanted to create a photo print of your slide, a general standard for print resolution is to have about 300 dots per inch printed on paper minimum to give great image quality. Most photo kiosks at your local superstore or pharmacy print at 300dpi. So if you were to enlarge your 1800 dpi image, you could make it about 5”x 7” and still have enough pixels to give you 300 dpi. If you planned on printing a larger image, i.e. an 8 x 10, then you would want to scan your slides at a higher resolution such as 3600 dpi. The quality of this process is excellent and is often chosen by customers who want to regularly enjoy their pictures and/or use them for special events. 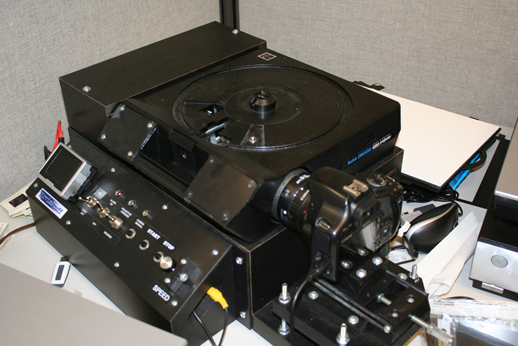 This is a snapshot of one of the Two Squares high speed slide scanning machines. 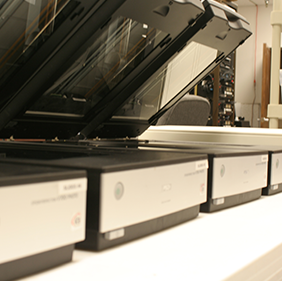 This equipment takes a digital image of the slide as it is and prepares it for digital post-processing. Slides are processed at a rate of roughly 8 seconds per slide. This is a snapshot of one of the Two Squares high quality slide scanning machines. 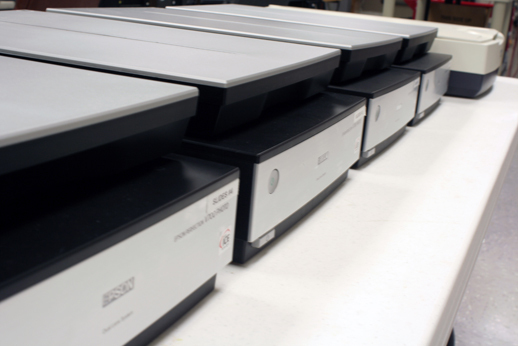 This equipment scans the slides for defects and calibrates color, contrast, levels, etc. before the final slide scan. Sides are processed at a rate of roughly 2-4 minutes per slide. Note There is a minimum order of $30 on all slides/photo/negative jobs.